12/31/2018 – Ephemeris – New Year 2019 – A new solar system body is being explored right now! Ephemeris for New Years Eve, Monday, December 31st. The Sun will rise at 8:20. It’ll be up for 8 hours and 51 minutes, setting at 5:11. The Moon, 2 days past last quarter, will rise at 3:54 tomorrow morning. 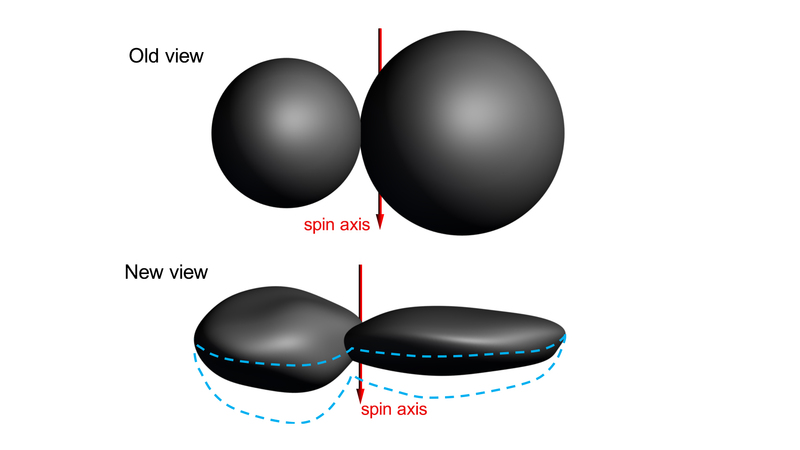 Later tonight the New Horizons spacecraft, which flew by Pluto and its retinue of moons, will fly by Kuiper Belt Object (KBO) 2014 MU69, nicknamed Ultima Thule. It’s probably an odd looking contact binary body with lobes 12 ½ and 11 miles (20 & 18 km) in diameter. That’s the guess as of a week ago. It will pass this body by 1,366 miles (2200 km), traveling at over 32 thousand miles an hour (52,000 kph). The spacecraft will pass closest approach at 33 minutes after the ball drops in Times Square. Nearly 4 hours later it will phone home. We won’t receive that message here on Earth until 10:28 a.m. due to the over 6 hours of time it takes the radio signal to reach Earth. We should get the first images by tomorrow night. The New Horizons spacecraft was built and is flown by Johns Hopkins Applied Physics Laboratory (JHAPL) is collaboration with NASA and the Southwest Research Institute (SwRI). 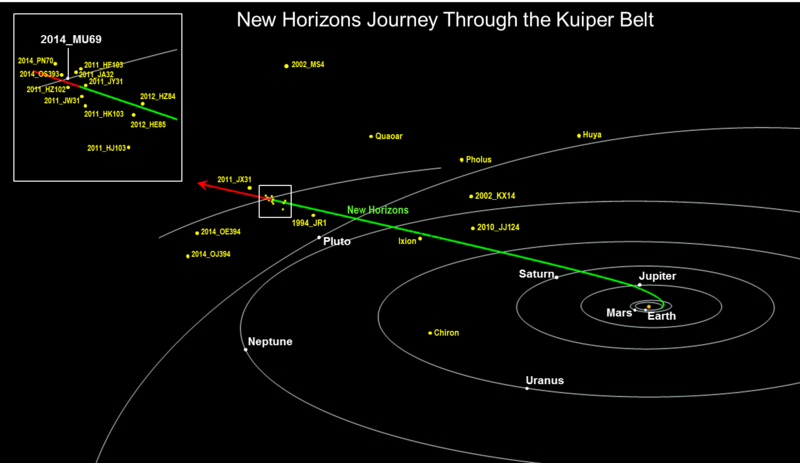 The Trajectory and position of New Horizons as it approached 2014 MU69 two months ago showing some of the KBOs recently discovered near its path. Credit JHAPL. 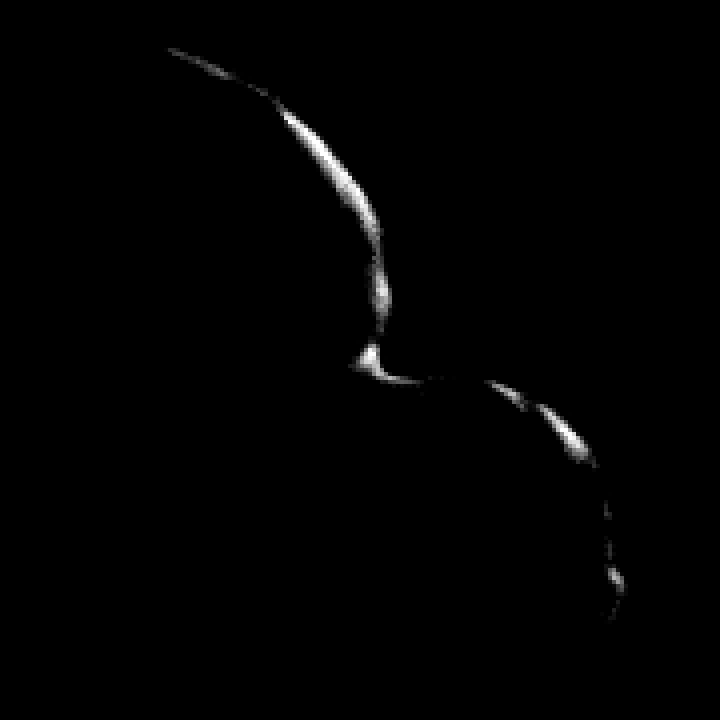 Silhouette of KBO 2014 MU69 (Ultima Thule) created by occultation timings on July 17, 2017 from southern Argentina. Credit NASA/JHUAPL/SwRI/Alex Parker. Links to information can be found here: http://pluto.jhuapl.edu/News-Center/Where-to-Watch.php. A cool app to follow New Horizons in real-time or to preview its passage of Ultima Thule is NASA’s Eyes: https://eyes.nasa.gov/. Ephemeris for Thursday, July 14th. Today the Sun will be up for 15 hours and 14 minutes, setting at 9:25, and it will rise tomorrow at 6:11. The Moon, 3 days past first quarter, will set at 2:57 tomorrow morning. One year ago today the New Horizons Spacecraft flew past Pluto for our first closeup look at this small world and its satellites. And wow, what we saw. In actuality not all the data from the few hours of the flyby have been returned to the Earth. We saw ice mountains as high as the Rockies, Nitrogen plains that look like they flowed from what may be heat from below, and a possible subterranean water ocean, which was recently reported. 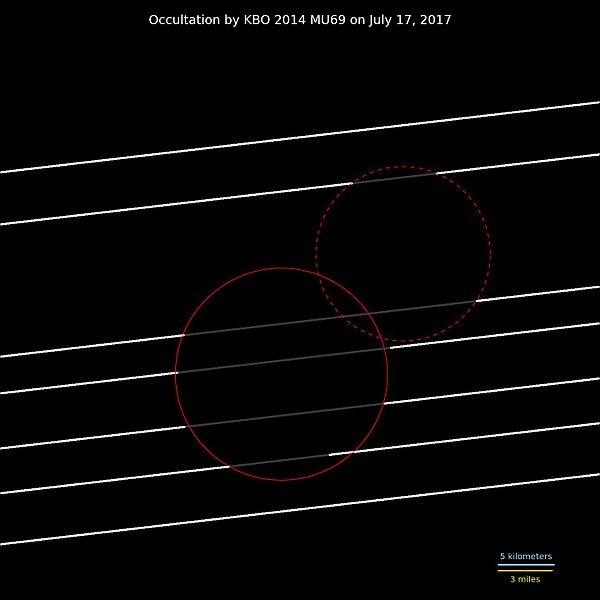 New Horizons has already tweaked its orbit to pass near another Kuiper Belt object 2014 MU69. Recently The New Horizons team received the go-ahead for the encounter with this, perhaps 20 mile diameter body. The flyby will take place on January 1, 2019. Krun Macula – Krun is the lord of the underworld in the Mandaean religion, and a macula is a dark feature on a planetary surface – is believed to get its dark red color from tholins, complex molecules found across Pluto. Krun Macula rises 1.5 miles (2.5 kilometers) above the surrounding plain – informally named Sputnik Planum – and is scarred by clusters of connected, roughly circular pits that typically reach between 5 and 8 miles (8 and 13 kilometers) across, and up to 1.5 miles (2.5 kilometers) deep. Image and caption credit: NASA/Johns Hopkins University Applied Physics Laboratory/Southwest Research Institute. These odd fault lines are also seen on the Jovian moon Europa and Saturn’s moon Enceladus and could be the surface signs of an underground ocean. Credit New Horizons/ NASA/JHUAPL/SwRI. Here’s more information from EarthSky. New Horizon’s location as of yesterday. Heading out to 2014 MU69. Credit jhuapl.edu. Ephemeris for Tuesday, December 29th. The Sun will rise at 8:19. It’ll be up for 8 hours and 50 minutes, setting at 5:10. The Moon, half way from full to last quarter, will rise at 9:58 this evening. This past year had several important events. 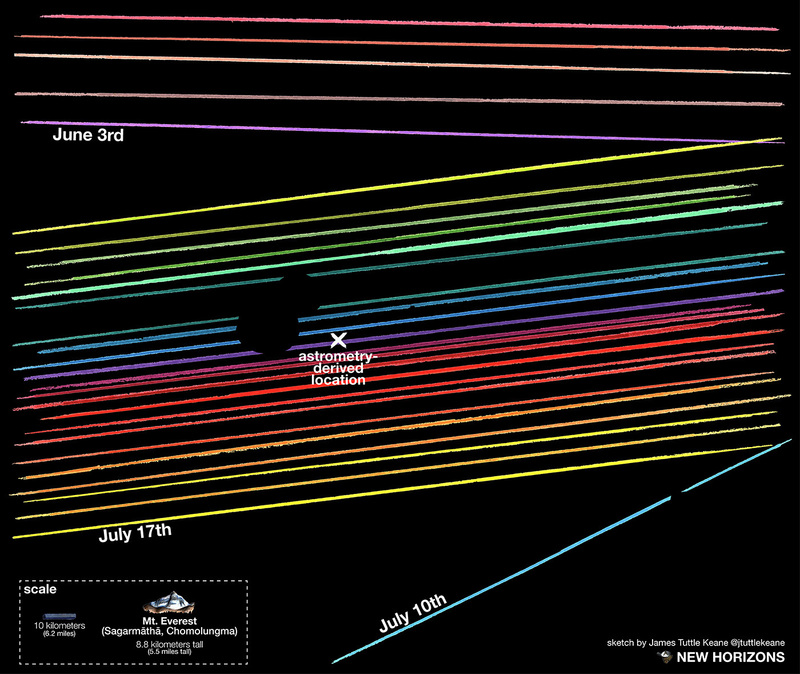 Perhaps the biggest was the flyby of Pluto and its moons July 14th By the New Horizons spacecraft. The transmission of data and images will continue for most of 2016, but what has been revealed has been spectacular if puzzling. In other space news Blue Origin landed their New Shepard rocket vertically after sending it straight up 60 miles. In June the SpaceX Falcon 9 blew up while attempting to send its 7th resupply Dragon capsule to the International Space Station. Eight days ago The Falcon 9 returned to flight orbiting 11 satellites for Orbocomm, and flew the booster from over 100 miles up and 100 miles out over the Atlantic to land upright on its designated landing pad back at the cape. Enhanced color portrait of Pluto by the New Horizons spacecraft. Credit: NASA/JHUAPL/SwRI. Blue Origin New Shepard rocket, with landing legs expended about to land. Credit: Blue Origin. First stage of the SpaceX Falcon 9 descending on its center rocket engine to the center of the main landing pad at Cape Canaveral. Credit: SpaceX. These weren’t the only highlights of 2015. Having only 45 seconds to devote to the story, I picked the three most important events. I consider the reuseability of rockets to be the Holy Grail of reducing the cost to access to space. The Space Shuttle was a partial, but ultimately failed solution. SpaceX had the most difficult task in refurbishment and reuse because the first stage had to endure a supersonic reentry, though it didn’t need a heat shield. We’ll have to see if the cost of recycling rocket boosters is cheaper than building one from scratch. Ephemeris for Thursday, October 29th. The Sun will rise at 8:16. It’ll be up for 10 hours and 19 minutes, setting at 6:36. The Moon, 2 days past full, will rise at 8:40 this evening. Images from the New Horizons spacecraft are streaming back slowly. It’s like trying to download a modern megapixel camera image using a thousand to two thousand bits per second telephone modem back in the ’90s. That’s why the images are dribbling out. They are released each Thursday or Friday. 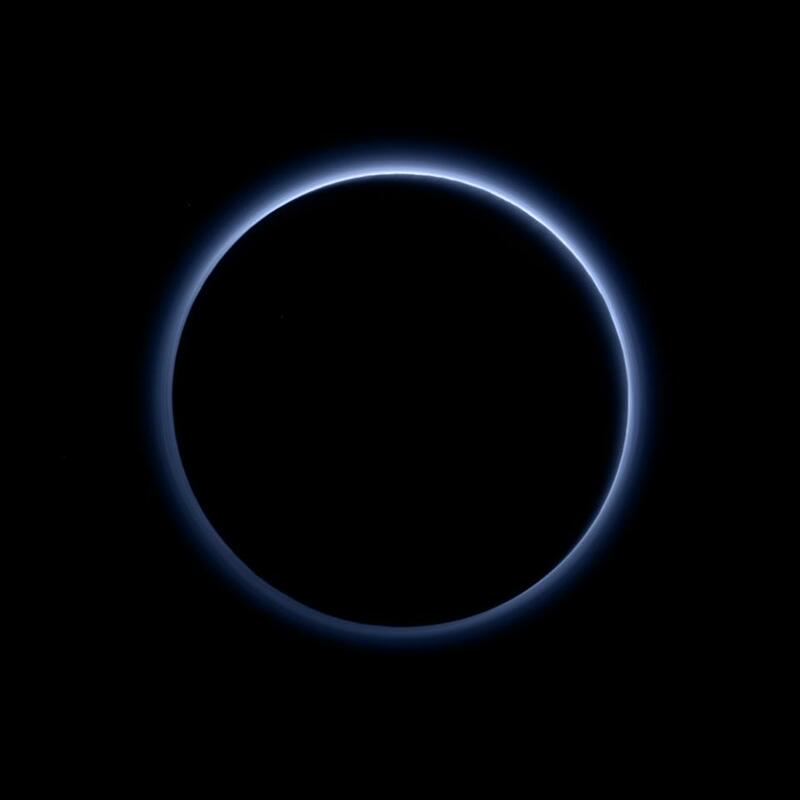 One of the last images was a colored image of the ring of atmosphere of Pluto backlit by the Sun, showing that the dwarf planet had a blue sky. The reason is still debated because there appear to be minute particles thought to be tholins in Pluto’s atmosphere. These would be colored brown or red. However they seen to preferentially scatter blue light like the nitrogen molecules in our atmosphere. Ephemeris for Friday, October 2nd. The Sun will rise at 7:41. It’ll be up for 11 hours and 40 minutes, setting at 7:21. The Moon, 2 days before last quarter, will rise at 10:53 this evening. 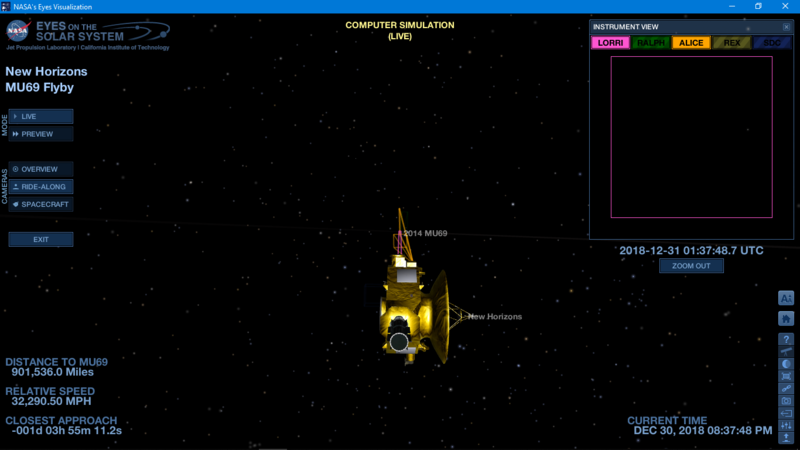 This evening yours truly will be reviewing the results so far from the New Horizons spacecraft and its close encounter with Pluto and its moons July 14th. This will be at the Grand Traverse Astronomical Society meeting at Northwestern Michigan College’s Rogers Observatory at 8 p.m. If you’ve not been keeping up with the releases of photos of Pluto and its moons be prepared to be amazed by the beauty of this frozen but apparently active world. Afterward from 9 p.m. there will be time to view the wonders of the autumn skies if it’s clear. If not there will be guided tour of the autumn skies via computer simulation. The observatory is located south of Traverse City on Birmley Road between Garfield and Keystone Roads. 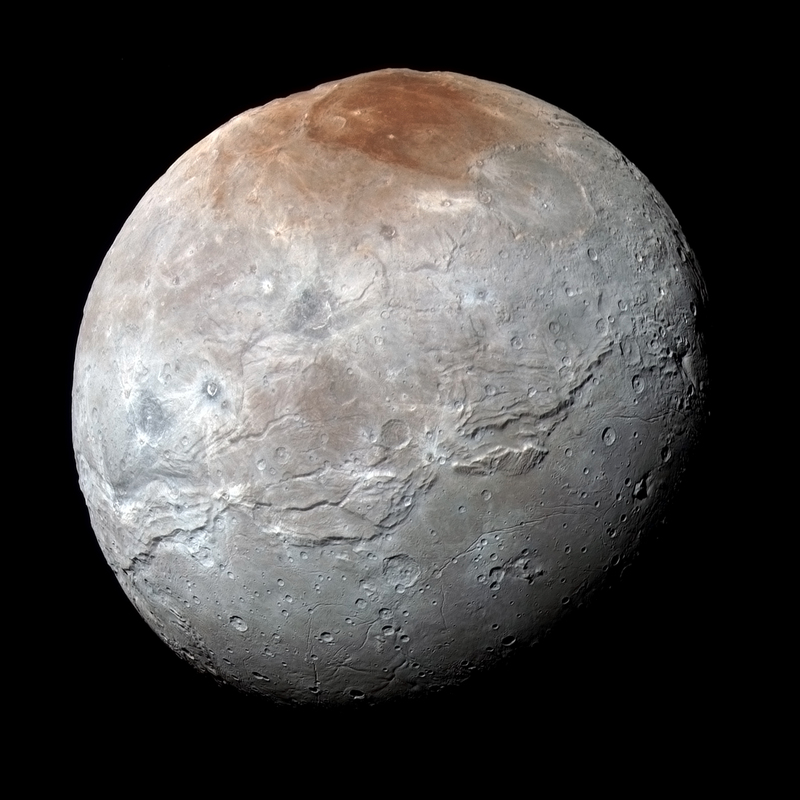 Latest high resolution color image of Charon released yesterday. Credit: NASA/JHUAPL/SwRI.